For many, these unfortunates were but two more victims of an unrestrained and merciless tyrant estimated to have executed almost two million non-combatants between 1939-75, during his arduous near four-decade-long reign of terror. But what separated this grotesque event from the rest of Franco’s merciless pogroms against his own people was that it took place not at the chaotic post-Civil War beginning of his ‘reign’, but twenty-four grueling years into his rule, and during this cynical tyrant’s attempt to pass off his regime as ‘respectable’ to the rest of the Western World. For, as a resurgent wave of underground resistance began –throughout 1963 – to rise up from the ashes of violent repression, General Franco openly recommenced his policy of institutionalised revenge and intent to eradicate from Spain all democrats, liberals, socialists and – above all others – his most-despised enemies from the war, the communists and anarchists. More shocking still, however, is that the fall-out from Franco’s methods has persisted right up to the present day. 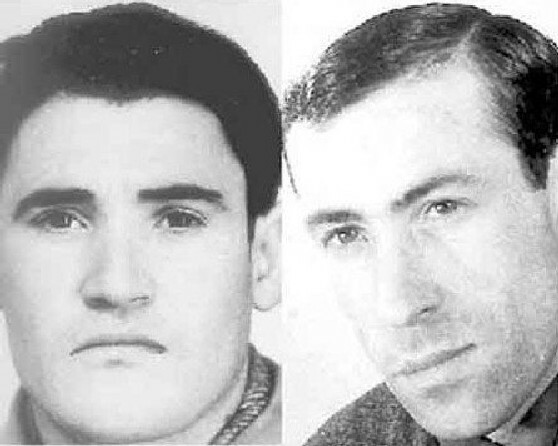 For when, thirty-five years later, in 1998, two anarchists Antonio Martin and Sergio Hernandez confessed that they had in fact planted the bombs, the present day Spanish authorities chose not to take the opportunity to draw a line under that dreadful Franco-line period, but shocked the aggrieved families of the innocents by upholding the 1963 verdict, adjudging it to have been delivered in accordance with ‘the prevailing legal disposition’. That the families of Granados and Delgado – knowing their relatives’ innocence – must continue their battle to clear their loved ones’ names shows just how hollow have been Spain’s attempts to eradicate the enduring infamy of General Francisco Franco. Seems odd to think that in the year I was born Franco’s regime was still murdering at will. How the 1998 government upheld the original verdicts is beyond belief. Mind you, I do wonder if the Spanish want to address their history and the events round the civil war. I worked with a young man from Galicia in Spain and his knowledge of the turbulent times of the Civil War was absolutely zero. Talk to him about POUM, CNT or Orwell and he had no idea. Very peculiar. I suppose it’s one way of dealing with such issues idrian. Seems to me to be a very unstable way of doing it though. If the Spaniards were able to not deal with it since Franco came to power, then why can it not continue? “The Pact of Oblivion” provided a general amnesty for Franco and his supporters after his death in 1975. People also agreed to not discuss the past for fear of opening up old wounds. It’s a very slow process. However, there were others, perhaps another 50,000, who were killed without even the simulacrum of a trial. Some were thrown alive from cliffs into the sea, or from high bridges into deep rivers…As an example, between July 1936 and December 1937, near the village of Concud in the province of Teruel, into Los pozos de Caudé, a pit six feet wide and 250 feet deep, were hurled the bodies of 1005 men and women, including adolescent boys and girls. Few of them were political militants. Their crime was simply to be considered critical of the military coup, related to someone who had fled, to have a radio or to have read liberal newspapers before the war. “During the first months of the fighting most of the deaths did not come from combat on the battlefield but from political executions in the rear–the “Red” and “White” terrors. In some cases the murder of political opponents began more or less spontaneously, but from the very beginning there was always a certain degree of organization, and nearly all the killings after the first few days were carried out by organized groups. Murder of the political opposition was an almost inevitable result of conditions of revolutionary civil war and the constant incitement to violence, particularly by the left, in the years leading up to it. Fear was also a major ingredient. Both sides knew that they had reached a showdown and were eager to eliminate potential opposition before it was too late. Within a matter of weeks Socialist and anarcho-syndicalist leaders tried to bring such killings under control. “Control patrols” were organized in many areas and a series of revolutionary “people’s courts,” that in most cases imposed much lighter penalties, were formed to channel the repression of anti-leftists. After about six months, when a reorganized Popular Front government began to reassert authority, most of the random executions were ended, but  under more centralized control, political killings continued throughout the leftist zone until the end of the war. The repression in the Nationalist zone was more centralized and much more effective. Though often carried out by right-wing civilian groups, the White terror was almost from the beginning nominally institutionalized under military courts-martial. It was also more efficient, for, being under more coordinated direction, it was concentrated against the most dangerous opposition elements. By contrast, particularly during the first six months, each Red terror group operated on its own in a frequently irrational fashion, murdering innocent people and letting some of the more dangerous go free. Moreover, one of the main targets of the Red terror was the clergy, most of whom were not engaged in overt opposition. The toll taken by the respective terrors may never be known exactly. The left slaughtered more in the first months, but the Nationalist repression probably reached its height only after the war had ended, when punishment was exacted and vengeance wreaked on the vanquished left. The White terror may have slain 50,000, perhaps fewer, during the war. The Franco government now gives the names of 61,000 victims of the Red terror, but this is not subject to objective verification. The number of victims of the Nationalist repression, during and after the war, was undoubtedly greater than that. Grim as the reality was, it was immediately exaggerated by both sides, eager to deepen the guilt of their adversaries and underline the sufferings of their own people. Thus the legend of the millón de muertos, which exaggerated both terrorist and battlefield deaths by approximately 200 percent, was widely accepted after the war and gave rise to a contemporary variant of the Black Legend that stressed the supposedly uniquely sanguinary propensities of the Spanish. In fact, compared with other revolutionary civil wars of twentieth century Europe, the Spanish Civil War was not remarkably lethal, either on the battlefield or behind the lines. In Finland, in 1918, approximately 1 percent of the population was killed during and in the aftermath of a four-month civil war. (1) It took the Spanish nearly three years to destroy proportionately as many of themselves, but  when this occurred in Spain it was put down by foreign observers to the “innate savagery” of the Spanish. There are so many dimensions to the war, politics being the most obvious but there were divisions between religious and secular, rural and urban, issues of regional autonomy and language in Catalonia and the Basque Country, even issues of race as Franco had African troops under his command. The anarchist Sabaté was killed in 1960, after a series of bank robberies and assassinations in support of the movement. The case of Delgado and Granados is a travesty of justice, but it should be seen in this context.